Staten Island's St George Day festival is volunteer-run and non-profit. Become a part of this event by volunteering for one (or several!) of the tasks below. All are guaranteed super fun ways to meet new people and practice cooperative creative problem-solving. Free St George Day 2015 t-shirt to all volunteers! High school students can use this opportunity to gather community service credits towards their graduation. Please contact Meredith Sladek, St George Day 2015 Volunteer Coordinator at sgdVolunteer@gmail.com with your name, the hours that you are available to volunteer, and what you are interested in helping out with. Thank you so much--we couldn't do it without you!! Help bring our dragons to life! 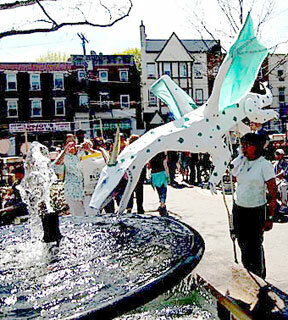 Lend a hand and carry a part of our magnificent multi-person dragon puppets as we parade through the festival park. Great for both adults and children!